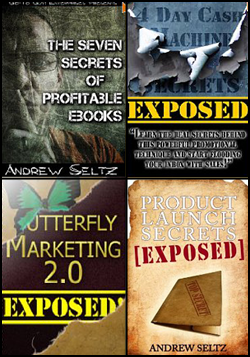 e-BookMarketingSecrets.com is a publication of Go-To Guy! Enterprises and Andrew Seltz is the Publisher and Editor of the website. This site was begun before the advent of the Kindle, the Nook, the iPad, and the countless other Android tablets and dedicated e-readers now on the market. In the early days, PDF e-books and compiled HTML documents were the primary format options for anyone publishing a digital book. Selling options were limited as well. But, things have been changing rapidly. As the landscape of electronic publishing continues to evolve, we are dedicated to staying ahead of the industry and providing you with the knowledge and insights needed to successfully publish and promote your books in the digital realm. If you have a comment or question about this website, please use the comment box below to let us know. This website is actively monitored and we will answer your question as quickly as possible. Thank you for visiting e-BookMarketingSecrets.com.